Thousands of people waved and cheered Thursday as funeral train No. 4141 -- named for the 41st president -- carried President George H.W. 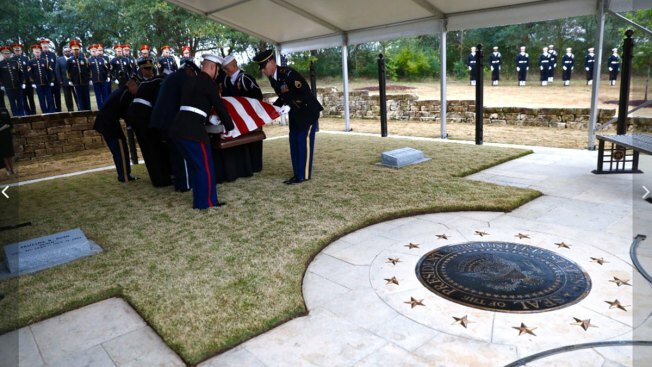 Bush from Houston to his final resting place on the grounds of his presidential library in College Station. Bush, who shaped history as America's 41st president and patriarch of a family that occupied the White House for a dozen years, arrived at Texas A&M University at about 4 p.m. Thursday. Shortly before 5:30 p.m., university officials said the graveside service had ended and the president had been buried. Shortly after the caravan arrived at the George H.W. Bush Presidential Library and Museum Thursday, wave after wave of F/A-18 Hornet fighter jets flew overhead, taking part in the largest 21-aircraft missing man formation ever flown in the United States -- an honor bestowed on the former president who was among the youngest naval aviators in history. The former president flew 58 combat missions in World War II, one of which ended up with him crashing in the Pacific Ocean before being rescued. After the flyover, Bush was carried to a secluded cemetery on library grounds where the family took part in a private graveside ceremony. Bush was then interred alongside his wife of 73 years, Barbara Pierce Bush, and their daughter, Robin, who died at the age of 3 from leukemia. The Navy honored former President George H.W. 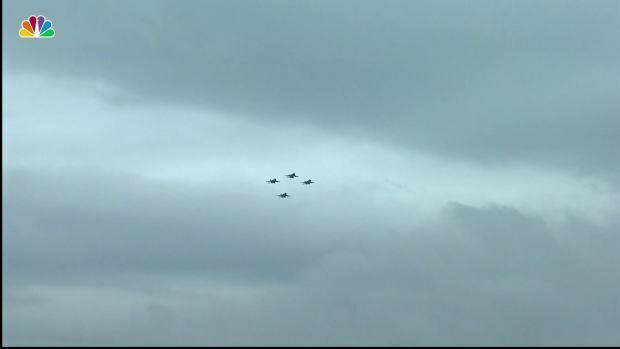 Bush with a 21-aircraft missing man formation above the George H.W. Bush Presidential Library and Museum. The morning began Thursday at St. Martin's Episcopal Church in Houston, where the night before thousands of people waited to pay their respects to the 41st president remembered as having the "courage of a peacemaker." Thursday's service began with "America the Beautiful" and a robust rendition of "The Star-Spangled Banner." It attracted local sports stars including Houston Texans defensive end J.J. Watt and featured eulogies from Bush's grandson, Texas Land Commissioner George P. Bush and James Baker, his former secretary of state and a close friend for decades. Baker remembered his longtime friend as having "had the courage of a warrior but the greater courage of a peacemaker" and began the eulogy Thursday with an apology. Using the nickname "Jefe," which is Spanish for "boss," Baker said he was going to brag about Bush, even though the former president hated boasting. Baker called Bush the "best one-term president" in the nation's history. He also praised Bush's grace after the fall of the Berlin Wall, saying that Bush understood that humility toward a fallen adversary "is the very best path." George P. Bush — the only member of the Bush dynasty still in public office — told NBC 5 earlier this week he'd be speaking from the heart about his grandfather and that he and Bush's 16 other grandchildren grew up in awe of the man they knew as "gampy." He told mourners Thursday that the former president would challenge his grandkids to games like "the first to sleep award." He reminisced about "growing up in awe" of his grandfather, whose "typical spread included BBQ, tacos, or pork rinds with hot sauce — of course with a healthy dose of Blue Bell ice cream." 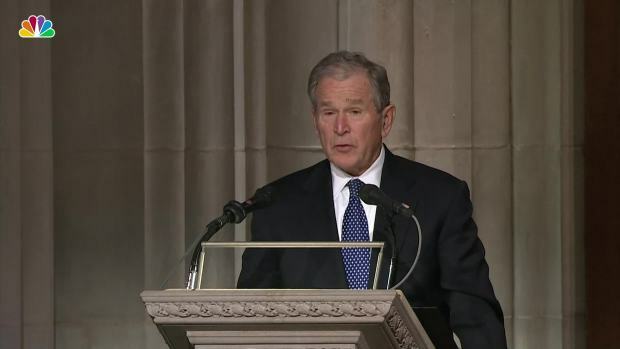 Hymns being sung were chosen and loved by the former president, said the church's pastor, Rev. Russell J. Levenson Jr. Performing were some of Bush's favorite country music stars, including the Oak Ridge Boys doing "Amazing Grace" and Reba McEntire offering "The Lord's Prayer," as three days of official ceremonies in Washington gave way to more personal touches for the former president in Texas. 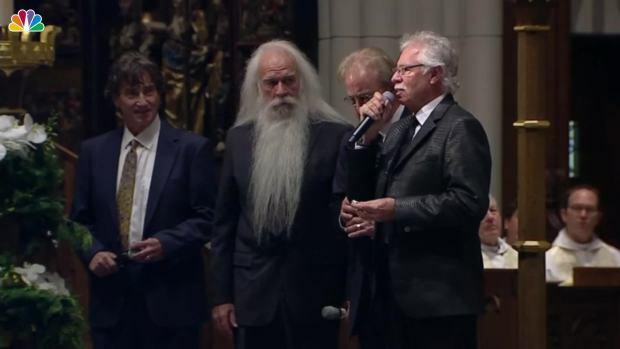 The Oak Ridge Boys sing a rendition of "Amazing Grace" at the funeral of former President George H.W. Bush. 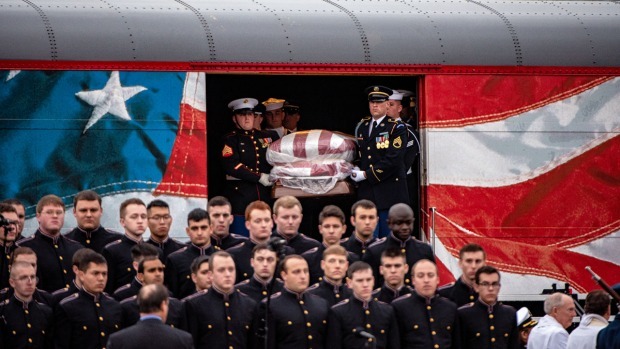 After the funeral, Bush's casket was driven north to Spring where it was placed onboard a specially-outfitted Union Pacific train powered by Locomotive 4141, an engine repainted to resemble Air Force One and named in his honor after he took a spin at the controls in 2005. He joked then that if the train had been around during his presidency he might have "left Air Force One behind," and traveled the country by rail. Thousands of people lined the train tracks between Spring and College Station Thursday to pay tribute to Bush. As Locomotive 4141 powered past, many waved flags, whelped and cheered. Others had placed coins on the tracks to be flattened into keepsakes. Doug Allen, of Cypress, left eight coins on the tracks before the train passed through the small town of Pinehurst. It left the coins flattened and slightly discolored. The funeral train will slow down through the towns of Old Town Spring, Magnolia, Tomball and Navasota. The train has 11 cars, with the president in the sixth. His American flag-draped coffin will be visible to all those along the route. The trip by rail was a personal request of the late president; he'll be the first president to be transported on a funeral train since President Dwight D. Eisenhower in 1969. 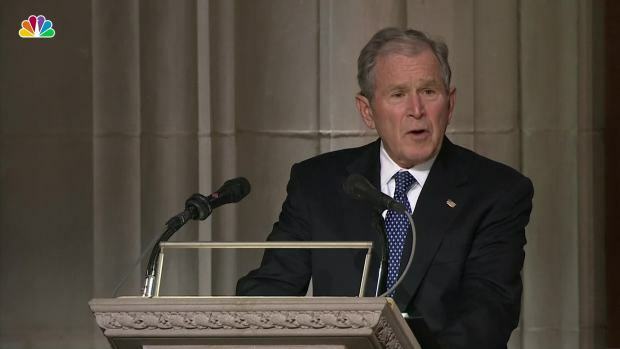 In the service at Washington National Cathedral, three former presidents and President Donald Trump looked on as George W. Bush eulogized his father as "the brightest of a thousand points of light." The cathedral service was a tribute to a president, a patriarch and a faded political era that prized military service and public responsibility. It was laced with indirect comparisons to Trump but was not consumed by them, as speakers focused on Bush's public life and character — with plenty of cracks about his goofy side, too. But he also said that Bush, campaigning in a crowd in a department store, once shook hands with a mannequin. Rather than flushing in embarrassment, he simply cracked, "Never know. Gotta ask." Meacham recounted how comedian Dana Carvey once said the key to doing an impersonation of Bush was "Mister Rogers trying to be John Wayne." None of those words would be a surprise to Bush. Meacham read his eulogy to him, said Bush spokesman Jim McGrath, and Bush responded to it with the crack: "That's a lot about me, Jon." Meacham praised Bush's call to volunteerism — his "1,000 points of light" — placing it alongside Abraham Lincoln's call to honor "the better angels of our nature" in the American rhetorical canon. Meacham called those lines "companion verses in America's national hymn." 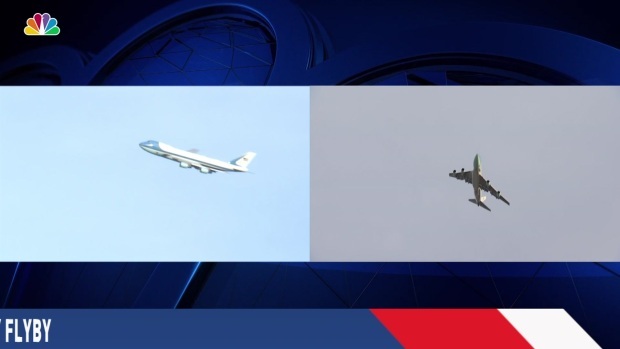 Before landing at Ellington Field JRB outside of Houston Wednesday afternoon, Air Force One -- dubbed Special Air Mission 41 while supporting the Bush funeral services in Texas and D.C. -- performed a low-altitude flyby, at an altitude of about 2,000 feet, over Bush's Presidential Library in College Station. Following the cathedral service, the hearse and a long motorcade drove to the National Mall to pass by the World War II Memorial, a nod to the late president's service as a World War II Navy pilot, then transferred his remains at Joint Base Andrews for the flight home with members of his family. Associated Press writers Laurie Kellman, Ashraf Khalil, Darlene Superville, Juan A. Lozano and David J. Phillip contributed to this report.